Recently I had the opportunity to listen to a lecture by Jürgen Moltmann, author of The Theology of Hope, The Crucified God, The Trinity and the Kingdom of God, and of other books. With others I was able briefly to talk to him afterwards. He lectured for an hour in good English (no doubt learned when he was - as he told us - a prisoner of war here in 1946), and then responded to questions for half an hour or so. Pretty good for someone aged 88. He is a humorous, self-deprecating, rather puckish person, not by any means the stereotype of the famous German theologian. (I remembered an earlier lecture of his twenty or so years ago when he seemed rather aloof.) He had come over to Oxford from Germany that day and was staying in a study bedroom in the College at which he was speaking. Moltmann is noted for his very anthropomorphic conception of God. I cannot say that there was much that was new or startling in his lecture on this front. He spoke about the Anglican theologian J B. Mozley’s six questions about divine impassibility in his book The Impassibility of God. His treatment of these questions might well madden you, just as his starting points may be thought to be question-begging. I shall not go into any detail here, though it might be worthwhile to do so another time. For Moltmann, Mozley's treatment of the questions ended in each case in self-contradiction. How can an impassible God feel compassion? That's the unanswerable question given a metaphysics of substance, Moltmann says. What is needed instead, he insists, is a metaphysics of subjectivity, not substance. You see how far this is from Chalcedon. So part of the story is that bad Greek metaphysics infected the Christian theology of past generations, and now thanks to Hegel we have an appropriate metaphysics. There is no 'moodiness' in God, a moody god is Greek popular myth, the Homeric gods. But he is steadily passible, so to say. He repeatedly claimed in the lecture that Mozley was unable to resolve the clash of thesis with antithesis in our thinking about God because of his underlying metaphysics. It became evident (to me at least) that Moltmann’s way of going about things is thoroughly hegelianised. He is not an anthropomorphite simply because he is sentimental about God, wanting a God near to him, nor because of jejune bible study. His doctrine of God depends on Hegel, a hegelianised Trinity in which each Person is a dramatis personae, the drama being the unfolding of God - God as he is - in periods, God the Father, and then the Son, and then the Spirit. But not three persons in one substance, or two natures in one person. One God constituted through a three-act drama. Afterwards we were able to talk briefly about this and whether there was any time in his career when he was not a follower of Hegel. He said that there hadn’t been. And whether there was any way in which someone (like me, and the majority of the Christian theological tradition) could have a serious conversation with someone for whom God was to be spoken of exclusively in the language of subjectivity. He said that there wasn’t. But perhaps he did not understand me, and we failed to have a conversation about having a serious conversation. Nevertheless I was impressed once again by the way in which a continental Christian thinker will readily make Hegel (or Kant) a foundation stone of his theology, on a par with Scripture, so it seems. This creates a gulf that separates continental ways of thinking, not from English ways of doing theology, but from the main patristic, medieval and reformed way of thinking about the God of Scripture. Not a Greek superimposition, but a gulf arising from the data of Scripture itself. For those interested, the published version of Moltmann's lecture can be found in Within the Love of God, Essays on the Doctrine of God in honour of Paul S. Fiddes, ed. Anthony Clarke and Andrew Moore (Oxford, Oxford University Press, 2014). Recently there has been quite a bit of interest in the variety of views held by Reformed Theologians within the parameters of confessional orthodoxy. For example, it is argued the view that is described as ‘Amyraldian’ or ‘hypothetical universalist’ is in fact a variety of views. It has been generally assumed that these are two names for the same thing, but recent work has reminded us that Amyraldianism was a more radical set of positions than others in this family, and in fact that ‘hypothetical universalism’ is an umbrella term for various views of differing strengths, each of them distinct from Amyraldianism proper, that is, from the Amyraldianism of Möise Amyraut, and of John Cameron. This is not a new thought but it is novel to most of us, I suspect. Recent scholarship has involved delving into the distinctive views of various reformed communities and cultures - Dutch, Engish, French, Genevan and so on. In this post (and maybe in other posts; we’ll see how we get on), my aim is to give the broad outline of these two positions, and to refer to some of the figures involved. It will do not harm to start with Calvin. A distinction respecting the death of Christ that goes back to before the Reformation, is the expression that that death of Christ is sufficient for all, efficient only for the elect. It is usually thought to start with Peter Lombard. Here’s a comment of Calvin’s on it. ‘This solution has long prevailed in the schools. Though then I allow what has been said is true….’ He goes on to say it does not fit I John 2.1, the passage under consideration. So he approves the formula, though he does not often use it, but not to understand this particular verse. This is from his commentary on I John. In chapter 5 of his Calvin and the Reformed Tradition (Baker, 2012), Richard Muller takes his reader through the reflections of Bishop Davenant, one of the English Delegation to the Synod of Dordt, who wrote elaborately on this universalism. Davenant was at pains to stress that this death is not a salvific universalism, as regards the question of those who fully benefit from it. Nonetheless everyone benefits from it, to some degree or another. Whereas Calvin attribute common operations to the Holy Spirit, Davenant attributes them to Christ's death. In the very appointment or ordination of a Redeemer, God had some regard of common love towards me, which he had not towards devils. Which will appear further if we consider what this redemption is. It is, then, the payment of the just price due for us captives, not that we should actually be delivered on the payment of the price, but that we should be delivered as soon as we believe in the Redeemer. This is that ordination of the death of Christ or of a satisfactory price, which flowed from the common love of God to all mankind, and therefore, it is rightly declared to be extended, under this condition, from us to all men individually. And to this we think that celebrated passage refers, John 3.16, God so love the world etc. Contemporary discussions of Davenant don’t pay much attention to this ‘common’ side to the death of Christ, but it was important for Davenant. Davenant cites early Reformed theologians such as Pareus as as well the history of Augustinianism, so that I don’t think that this cast of the Reformed theological mind can be called ‘deviant’ if that means a later deviation from an earlier consensus. One might even say that it is an instance of ‘defiant’ theology. Some of what Davenant writes is clearer than other parts. But it seems that a primary thought is that Christ died for the world in a universal sense, from which flows what are nowadays called the gifts of common grace, and warrant for the indiscriminate preaching of the gospel. From such preaching, if he pleases, God brings some - his elect - to faith and new life in Christ. It might be said on this view that the death of Christ was universally necessary, necessary for the salvation of any man, but also necessary for the general provision of health, and wealth of the race, and the virtues that any person may express, and the presence of gospel preaching. There are from the death of Christ generally or indiscriminately applicable non-saving benefits, such as Davenant insisted upon, not an actual salvific universalism nor (given the revealed divine purpose) its possibility, by which all could or might by an exercise of their own free will benefit from his death, but a hypothetical universalism. We could discuss further whether this meets the explicitness of Article XXXI. This view at least supports the hypothesis, that had God been pleased to elect every person, then the perfection of Christ’s redemption would have been sufficient to cover all their sins, and the preaching of Christ would have reached them all. Davenant did not for one moment deny the particularism of God’s election, its non-universalism, but for some reason which is not too clear, in the circumstances of his day Davenant made the upholding of this hypothetical universalism a priority. Davenant also published Animadversion upon a Treatise intitled God’s Love to Mankind (1641), upholding his particularism. Perhaps that’s enough for now, though there’s a great deal of interest in The Death of Christ for any who like scholastically-minded theological discussion. And some questions. What's hypothetical about this version of hypothetical universalism? How, according to Davenant, is the work of Christ to be understood? How does his view of the death of Christ (and only this view?) warrant and facilitate the unfettered preaching of the gospel? I hope we may get around to discussing some these. But next time I shall discuss Amyraldianism. 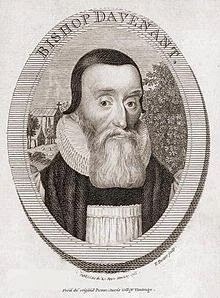 John Davenant became Bishop of Salisbury in 1621 and was a Deputy to the Synod of Dordt. On the questions sketched above he published A Dissertation on the Death of Christ written in the 1620’s, published in Latin in 1630, and translated by Josiah Allport in 1832, and can be found at the end of his translation of Davenant’s Commentary on Colossians. (Josiah knew the difference between Davenant's view and Amyraldianism even if it was forgotten in the meantime. )The Commentary (but not including the Dissertation) has recently been republished by the Banner of Truth, and the Dissertation by the Quinta Press. Davenant distinguished his position from that of Amyraut in his short work with the long title On the Controversy among the French Divines of the Reformed Church Concerning the Gracious or Saving Will of God towards Sinful Men, also published by Allport with the Dissertation and referred to by Richard Muller as De Gallicana. (128) On what has been called English hypothetical universalism see Jonathan Moore, English Hypothetical Universalism, (Eerdmans, 2007). See also Oliver Crisp, Deviant Calvinism, (Fortress, 2014), Ch.7.